As mounting violence in recent years has led to an ongoing security crackdown in Xinjiang, the diverse northwestern region of China has increasingly become a focus in Western media reports. Central authorities work hard to manage the media narrative on the sensitive region by restricting journalists’ access to certain areas and harassing foreign reporters who visit, issuing a steady flow of censorship directives related to specific incidents, and insisting that domestic outlets follow state media’s lead in their coverage. Amid these tight controls, foreign papers rely on coverage informed by overseas activists and anonymous sources. The opacity often leads coverage to focus on the very politics that obscure the narrative, and to ignore the nuances of a massive region with exceptional geographic, ethnic, and cultural diversity . For nearly a decade, 32-year-old American entrepreneur and student Josh Summers has lived in Xinjiang, a place that he’s grown to love and call home. He and his wife first moved to the small town of Karmay in 2006, and now live in Urumqi with their three-year-old son. Since his arrival in Xinjiang, Josh has steadily updated his FarWestChina blog, where posts have covered everything from the secrets of Uyghur cuisine delivered straight from a kebab vendor, to his experience on Xinjiang’s newly opened high-speed train, to an open letter to Xinhua contrasting their rose-tinted description of a 10-month regional Internet blackout in 2009. Josh has also documented his extensive travels in the region on his blog, and recently released the eBook “Xinjiang: A Travelers Guide to Far West China.” In an interview with CDT, Josh took some time to talk about life in Xinjiang, his new travel guide, and his take of the regional political situation—and the subtleties often missed in the mainstream media narrative. China Digital Times: What attracted you to Xinjiang to begin with? Josh Summers: Most people I know who come out here tend to have some sort of connection to Xinjiang prior to arriving, such as an interest in Uyghur culture, passion for the Silk Road history, etc. Their love of Xinjiang prompts them to decide to move here. I was exactly the opposite. For better or worse, I probably arrived here as one of the most ignorant foreigners in the region. I couldn’t pronounce Xinjiang and had no idea the difference between a Uyghur and a Hui person. For me, it was my moving here that prompted a passion for Xinjiang and its people. My story is one of those “friend of a friend of a friend” kinds that ended with my wife and I being offered jobs in what we were told was a remote but beautiful part of China. We committed to one year but quickly fell in love with Xinjiang and ended up staying in Karamay for almost four years. CDT: What inspired you to write “Xinjiang: A Travelers Guide to Far West China“? How long have you been working on this project? JS: I remember sitting in front of my computer late one night last year, answering what felt like the 100th email question regarding travel to Xinjiang. I love answering questions in regard to Xinjiang, I really do, but that night I was cursing the day I put up a contact page on FarWestChina! It was at that moment I decided to compile all of the information and experiences I had gathered over the past decade into a travel guide specifically dedicated to the region. Up to this point there was no place where travelers could find and download a comprehensive guide to Xinjiang that provided up-to-date information alongside interesting historical context. The project took me three months to complete, although in reality I’ve been researching and writing for years. Xinjiang is still China’s “wild west” and my goal here is to provide a quality roadmap to the region, giving travelers the confidence to make the journey without taking away from the mystery that makes this corner of the world so fun to explore. CDT: Do you plan to compile any more travel guides in the future? 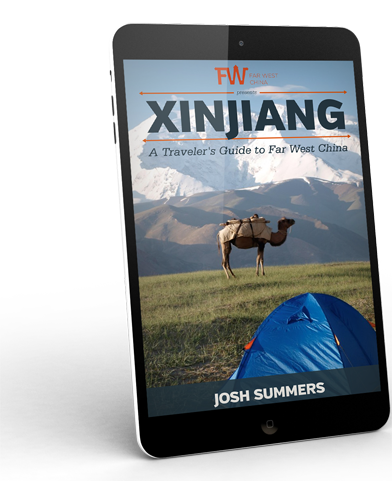 JS: I plan to improve the FarWestChina Xinjiang travel guide with photos, new places I discover and updated information on an annual basis, but as far as more travel guides….I know my limits. I have little expertise beyond the borders of Xinjiang! My next big project is a Uyghur cookbook complete with video tutorials. It’s something that’s been in the planning stages for about six months and should be complete before the end of the year. Frankly, I don’t consider myself a “travel writer.” I am not a nomad searching for the next big adventure; I consider Xinjiang my home now. If I can shed positive light on this beautiful region and fascinating mix of cultures, I’ll consider all the work I’ve put into FarWestChina a success. CDT: What aspects of life in Xinjiang have kept you there for the better part of a decade? JS: For me, Xinjiang offers the appropriate balance of adventure and opportunity. I could spend another two decades here and still not have enough time to explore all the beautiful facets of this region. In my opinion, there is no other place in China that offers such a variety of natural scenery, not to mention the thirteen different ethnic groups. I’m also keenly aware of all the investment that China has been making in Xinjiang and I know that in the not-so-distant future, this region will become the most important economic hub throughout Central Asia. There is incredible opportunity waiting for those who are willing to brave the current instability. CDT: What are some of your favorite places and most memorable experiences from your decade time in Xinjiang? JS: My favorite place in all of Xinjiang is Tuyoq Valley, a small village approximately 40 kilometers east of Turpan. The mud-brick homes surrounded by grape orchards and backed by the Flaming Mountains are picturesque; meandering through the dirt roads feels like you’ve stepped back into history. My favorite landscape would be the view of Karakul Lake and Muztagata Mountain along the Karakoram Highway. Sitting beside the Kyrgyz yurt with millions of stars illuminating the serene water and majestic Pamir Mountains is a memory as clear as a painting in my mind. Finally, my most memorable experience in Xinjiang would be during a trip to Kashgar in 2008. It was the end of Ramadan before the city began to make major changes. Tens of thousands of worshippers gathered around the famous yellow face of the Id Kah Mosque to pray followed by joyous dancing in the square, which is now banned. Locals invited me to a festive meal and led me through the now-reconstructed alleyways of the Old City. It was incredible. CDT: Most Xinjiang related news coverage has long focused on ethnic policy, unequal economic development, unrest, and over the past 18 months, Beijing’s “war on terror.” Amid this, the adjective most used to describe the northwest in reports has since the 2009 Urumqi riots been “restive” [see more recent examples from Reuters, The Japan Times, The Wall Street Journal, or TIME]. From your point of view, is this a fair characterization of the region you’ve grown to love? JS: Ah, yes…”restive.” While the word certainly fits the situation in Xinjiang, I feel like it is too often used as filler for times when a more nuanced explanation of the situation would benefit the reader. There’s no use trying to sugarcoat the events of these past six years in Xinjiang or ignore the fact that lives have been lost. I have friends from many different ethnic backgrounds and they all have compelling stories and valid reasons to be afraid or angry. Unfortunately, depending on how you choose to interpret what has happened, the word “restive” does more to describe the symptoms rather than the problem. What saddens me most is that many people—both Chinese and foreign—judge Xinjiang by this vague description and never have the opportunity to see for themselves the beautiful, albeit dysfunctional, patchwork of cultures. CDT: Are there any under-covered topics that could better illustrate the nuances of Xinjiang’s uniquely diverse social and physical landscape? JS: I wish I had the means and time to film a documentary on cross-cultural relationships in Xinjiang. They’re rare, but they do occur across a number of different ethnic groups. The difficulties and prejudice experienced by these couples seems to me to be an excellent example of the intricate difficulties Xinjiang has to overcome. CDT: Last year, you posted a fantastic open letter to Xinhua, contrasting your experiences during the 10-month Internet blackout that followed the 2009 riots with state media’s utopian portrayal of the time. Are there other examples of how enhanced security measures have affected you and your family? JS: There’s an old anecdote about slowly boiling a frog that I feel applies to my experience here in Xinjiang. Because new security measures have been slowly implemented over several years, the experience that might shock the casual Xinjiang traveler feels perfectly normal to my family now. CDT: How noticeable are the ethnic tensions so often featured in foreign reports on Xinjiang? JS: Honestly, from my relatively safe perch here in the capital of Urumqi, it’s difficult to sense what is happening in the small villages in southern Xinjiang where most of these events occur. Likewise, I mentioned to a Uyghur friend about going to eat at a Chinese person’s house and was treated to a 10-minute long explanation about how disgusting a Chinese kitchen is. Both are very innocent examples, but if you spend enough time digging into the deeper feelings that drive such comments, you might be shocked at what you find. CDT: Do foreigners receive different treatment by Han Chinese? Uyghur? Authorities? JS: I enjoy the fact that most people think I’m Russian! There are far more Russians in Urumqi than there are Americans and it’s not uncommon for people to expect me to understand Russian. Thankfully, I feel like my family is treated with equal respect from both the Han Chinese and Uyghur people. As far as I can tell, we are not seen as being a part of or responsible for the ethnic tensions that exist, which is good. Personally, we make every effort to respect our friends no matter which ethnicity and hope to receive the same in return. For example, we’ve decided to keep our home halal and free from alcohol out of respect for our pious Uyghur neighbors. Remaining in the good graces of the local authorities has been a challenge, not because we present any threat, but likely because we’re just a headache to watch over. I certainly receive no special treatment because I’m a foreigner! I feel like rules for foreigners are more strictly followed here in Xinjiang, which means that I know my local police quite well. CDT: Travel restrictions also often feature in foreign reporting on Xinjiang, as does the lack of access for media. Has your longtime place of residence and ongoing blog ever become a question when entering China? JS: There is no amount of money you could give me to travel through Xinjiang on a journalist visa! I feel sorry for any journalist who wants to vacation here—it’s just not a welcoming place. As a non-journalistic member of society, however, I have very few problems getting around Xinjiang. Obtaining my resident’s permit is a huge hassle but once that paperwork is done the worst is over. FarWestChina used to be updated anonymously but I have since clearly put my name on the site since I have nothing to hide. To my dismay, the authorities don’t send me updates on what they think about my website so I have to rely on the fact that they keep issuing me visas…so I must be ok.
CDT: Has your site been censored in the past? What types of posts seem to have attracted censors’ attention? JS: FarWestChina website has been blocked in China since 2008. I’ve run multiple tests to determine what kind of censorship it is and have come to the conclusion that it is a direct URL block. As much as I’d like to appeal this block, to whom would I send the appeal? It’s a shame, especially since I believe China could benefit from seeing the genuine love a foreigner has for Xinjiang, but there’s nothing I can do about it. CDT: In your collective time in Xinjiang, and especially since the introduction of new policies that could be seen as targeting Uyghur custom and religion, has a diminishing freedom to express minority culture been noticeable to you as an observer? Has resentment among the Uyghur population seemed to grow? JS: That’s a difficult question to answer because the policies you refer to are not enforced in equal measure across all of Xinjiang. The people in Kashgar live by a different standard than those in Ili (a city in northern Xinjiang) due to incidents that have happened throughout the south. As authorities fight to control the radicalization of certain communities in Xinjiang, something that historically hasn’t been a part of Uyghur Muslim identity, a number of beautiful customs and expressions of Uyghur culture have become unfortunate casualties in the battle. CDT: How do your Han acquaintances view enhanced security measures in recent years? JS: Most Han Chinese that I know find stability and comfort in these security measures. In fact, I’ve come to believe that some of the “measures,” such as metal detectors and bag checks, are meant only to reinforce the feeling of security without actually providing security. The metal detector goes off every time and the security officer does nothing more than a cursory glance into the bag. A lot of it is just for show, but it’s a part of what makes people feel comfortable here. CDT: While reading your travel guide, I couldn’t help but notice a lack of note on certain dangers specific to Xinjiang these days, be they related to the current security crackdown or to areas that have seen frequent violence. You have, however, on your blog advised temporarily against traveling to Xinjiang as the ongoing security crackdown was ramping up. Can you discuss what went into making the decision not to mention the delicate nature of Xinjiang travel in your book? JS: Great observation! That warning I gave came after the U.S. State Department advised its employees not to travel to Xinjiang. It didn’t seem wise to contradict them. In my experience, based on the thousands of emails I have received from travelers, nobody needs to be told about the delicate nature of Xinjiang. In fact, I spend 95% of my time just trying to convince people that it’s quite safe for a foreign traveler to visit. If it weren’t, I wouldn’t have brought my family to live here. I dedicate sections of the book to particular safety issues in Xinjiang and how to avoid problems with authorities. I also mention certain villages that might be difficult to access due to high security. In general, though, my goal isn’t to highlight the dangers of Xinjiang. I’ll let the State Department worry about that. CDT: In the post mentioned/linked above, you mentioned: “My advice for now […] is to just stay away for the next two months. I don’t think you know how hard that is for me to admit.” Why is that such hard advice to give? JS: As I said earlier, I feel like Xinjiang is my home now and telling travelers to not come visit is difficult! Although I don’t think too highly of myself, I also know that as one of the only sources of information on Xinjiang, I can’t underestimate my influence. Over the past decade, to my knowledge not a single foreigner has been physically injured as a result of this ethnic conflict in Xinjiang. I feel confident encouraging people to travel here but I also don’t want to be the reason that anybody gets hurt. If embassies begin advising against travel to Xinjiang, I feel I need to do the same…even if I feel perfectly safe. CDT: Originally launched as a yearlong crackdown, the campaign has now been extended at least until the end of 2015. Has the situation on the ground changed since May 2014? What advice would you offer a traveler thinking about heading to Xinjiang today? JS: Most of what happens in a Xinjiang “crackdown” goes unseen by the public. There was a massive display of force in May of 2014 and since then I would guess that military presence on the street has increased, though not by much. In my opinion, this is the perfect time to travel to Xinjiang. You won’t be surrounded by busloads of tourists and prices are low due to decreased demand. Perhaps I’m just biased, but I can’t think of a better place to spend a summer exploring China than out here in the far western region of Xinjiang.